This is the fourth instalment in what seems to be a series of the complete Mozart piano concertos on the enterprising German label MD&G. 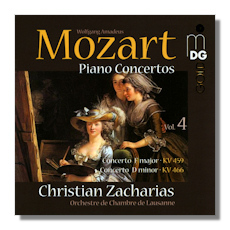 Christain Zacharias directs and plays the solo part together with The Orchestre de Chambre de Lausanne. These latest two concertos confirm what we have already noted in previous discs, a steady approach to the solo pat and a restrained, somewhat muted approach to the orchestral parts. Not that this is not without its benefits as the relative earthiness of KV 459 is brought out quite impressively with the First Movement particularly effusive and beautiful. The Allegretto is also very well played as is the wonderful Finale which dances about quite prankishly and with Zacharias very much in his element all along. KV466, one of Mozart's most famous works is less successful as some parts of it seem rather too restrained, especially in the conclusion of the First Movement. However the Allegro assai is quite winningly done although again it is not really comparable to the long list of legendary greats who have graced this magnificent work. As expected, recordings are of the highest quality throughout with just the right amount of separation between piano and orchestra. Those collecting the cycle will obviously not feel short changed although there are much finer versions around, especially of KV 466.